Without that authority — provided under Title II of the Communications Act — the FCC lacks any effective means to stop Internet discrimination. Companies like AT&T, Verizon and Time Warner Cable could forge ahead with their plans to create a two-tiered Internet, striking special fast-lane deals with websites and services that they like, while relegating the rest of us to slower and congested ones. 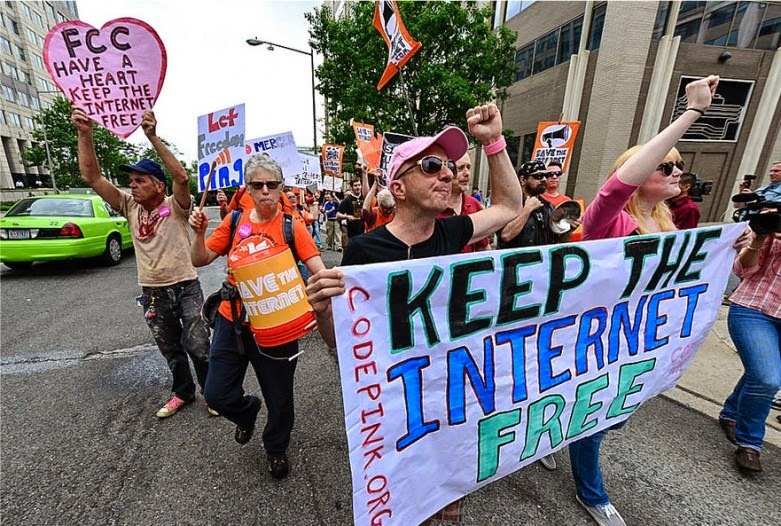 Without common carriage protections, these ISPs can slow and even censor web content at will. And they’ve already admitted to plans to do just that. So why is Rep. Latta claiming to be a champion of the open Internet while proposing legislation that helps ISPs shut it down? A big part of the answer can be found at the Center for Responsive Politics, which aggregates data on campaign contributions, including those made by phone and cable companies and their trade groups to members of Congress. 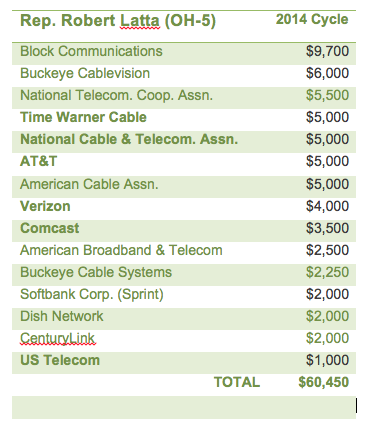 Rep. Latta is an industry favorite, having raked in a whopping $320,000 in campaign contributions from the communications sector since he took office in 2007. By now it should be clear that Latta’s bill is for the biggest companies that punch his campaign dance ticket, and not for the millions of people who have urged the FCC to protect the open Internet by making these same companies common carriers. But while Latta may be pushing this bill, he’s not alone on Capitol Hill. Nor is his congressional brand of quid pro quo limited to one side of the aisle. Earlier this month, 20 Democrats signed a letter to the FCC warning Chairman Tom Wheeler away from making ISPs common carriers. According to research by Maplight, these Democrats have received on average much more in campaign contributions from the phone and cable lobbies than the non-signing members of Congress. One in particular, Rep. John Barrow (D-GA), has received nearly $60,000 in campaign contributions from these industries in this most recent election cycle — more than five times the average amount received by his House Democratic counterparts. People across the country are taking action to make sure that Rep. Latta’s toxic bill doesn’t get traction any other elected representatives. Reclassifying ISPs as common carriers is the only way to stop phone and cable companies from taking control of the Internet away from users. If the FCC fails to take this simple step — or if it’s restricted from doing so — the Internet as we know it could be lost. That’s exactly what companies like AT&T, Comcast and Verizon want. And they are paying good money to make sure Congress does their bidding.